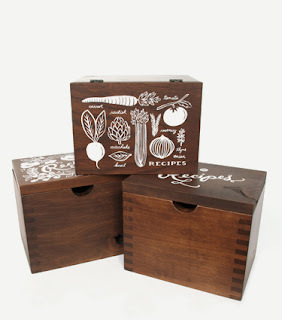 I came across these recipe boxes while shopping around at the Charleston paper company, mac & murphy. These pieces, by Rifle Paper Company, are handmade from locally salvaged hardwood. 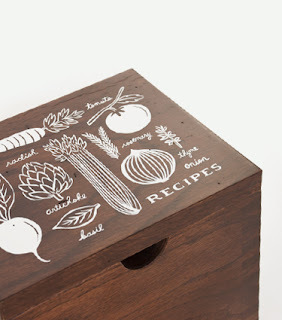 A proper recipe box is just one thing I think a lady should own. In my opinion there are a few items that separate the girls from the ladies: a collection of clutch purses, fancy salt and pepper shakers, a dainty monogrammed handkerchief, a vintage brooch and a proper recipe box. What good is a fancy recipe box without fancy recipe cards to go with them? Luckily, Rifle Paper Company has plenty of cards to choose from. 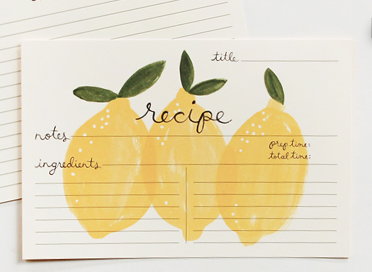 My favorite ones are the 4x6 Lemon Recipe Cards.